The golden brown grass ecstatically dances as the wind gently rushes over the field. Four vehicles parked on the rim of the gaping sinkhole and casual chatter started the next adventure. After all the rigging was done, Steven had his second breakfast while we joined him with an array of other snacks. Laughter echoed through the usually quiet place as we exchanged a few jokes. We were ready for our descent into the infamous Armageddon. Pedro went down first with Herman following. I was next and Steven trailed. This time around I followed Steven down the slope far left. Muddy clay had us sliding down on our bums. Sometimes at uncontrolled speed, but this added to the fun. Armageddon might be a lot of things, but it has never ceased to amaze me. After a few visits to this magnificent cave system, I remain in the stance that the only easy thing about this is the ‘SRT’ part. The rest demands respect and wrong footing or over eager movements will have you in some pain. The plan was pretty straight forward. We were in the company of 2 geologists, Pedro and Herman, who needed some sampling done. This was needed to confirm dating and some more academic stuff. It turned out to be a very informative trip. We climbed up a much less travelled slope and yet again, seeing the small dot of light from Steven’s headlight on the other side highlighted the vastness of this chamber. The thrust lines were inspected and small samples of rock were taken from the top, middle and bottom part. This was placed in small plastic bags and marked clearly. Rough sketches were made in a little black book and added to this some info like depth and gradients at which the lines were sloping. It was like watching a tennis match with the conversations that took place on that small ledge accommodating the group. 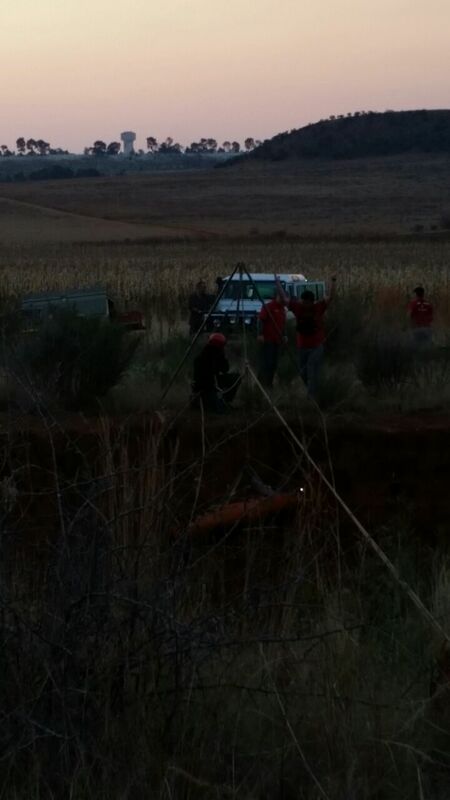 Lots of really big words and small talk about the Vredefort incident and also the bushveld influence. The rock in these fracture lines were referred to as Fubarite, but it is really just an informal name in geology for any rock that has been severely brecciated and metamorphosed to the point that it is difficult or impossible to determine its origin. There is also an acronym for it, but that will remain unwritten for various reasons. We packed everything up and were moving to another important area, fondly known in my mind as the bubbly area. Steven and I were climbing up huge boulders and standing on the top of one which had me in awe of the rock formations. When you look up, you become quite dizzy. The wall on the far side looked like it was painted white and lines within this rock seemed to be broken up. Almost like Braille dots and seemingly waiting for someone to decipher the message. It was a real privilege to be in this place with people who were obviously incredibly passionate and knowledgeable about rocks and structures. We would stop and a whole lecture would be given which were absolutely pleasing to the soul. Aragonite also featured among the long list of rock and crystal types discussed. This crystal is the high pressure polymorph of calcium carbonate. As such, it occurs in high pressure metamorphic rocks such as those formed at subduction zones. We also found the same cauliflower formations than in Serunecjar although they were much smaller in Armageddon. It was time for another detour, compliments of Steven. Peek-a-boo was just above and we had the privilege of learning his secret on how to get up there. A slope awaited us and the scenery at the top was breath-taking. The floor, walls and roof was covered in glittering abundance. It looked like a fairyland. Corridors at the top led to a variety of look out posts high on the cave wall, in particular Peek-A-Boo. This was Armageddon undone. A part of a treacherous cave’s true soul. While climbing up I had a bit of a slip and sprained my ankle. Not too bad though, but I decided to turn back. I had some ice packs in my car and wanted to treat it as soon as possible before it became a problem. After all, there is always a next chance. Steven joined me. Pedro and Herman needed more samples and moved on. Steven and I were sitting at the edge after climbing out, chatting about general stuff when we saw movement on the rope. We got up to assist Herman and Pedro when they got to the top. Herman was talking loudly to convey the message that Pedro had fallen and hurt his shoulder. We decided to rig a 5:1 hauling system in order to get Pedro to the top. Herman assisted him to get onto the rope and we started hauling. We did not get very far because Pedro was in too much pain. In that moment Steven and I looked at one another and the quiet realisation of a full rescue attempt in motion made our minds scurry in all directions. We had the trailer with us and all rescue equipment was within reach. We decided that I would go down and prepare the SKED for the big haul up. While Steven was on the phone getting some man power to assist, I grabbed more water from my car and stuffed it with a few energy snacks into my caving bag. Steven gave me a space blanket and that also went into the bag. We got the SKED from the trailer and I took it out just for a final check to make sure everything is in there that would be needed. The blue rope was a real mind-changer. I held it in my hand, staring at it. I screened my mind for some recollection of where it should go on the SKED. I started explaining to Steven how I think I should do it. A few “this should go here and that should be there” and I was set to go. The SKED and utility bag were clipped on my safety and after I got on the rope, I asked Steven again about rigging the SKED. I had to make a decision. This was 50m down. I won’t have someone to check my rigging. What if I make a mistake and the SKED falls or Pedro falls out on his way up? I informed Steven that I’m not completely confident in rigging the SKED. The risk was too high to go down and rely on sketchy ideas of how it should be done. So Steven needed to go down with the SKED. A few cavers were contacted and also Mountain Search and Rescue. 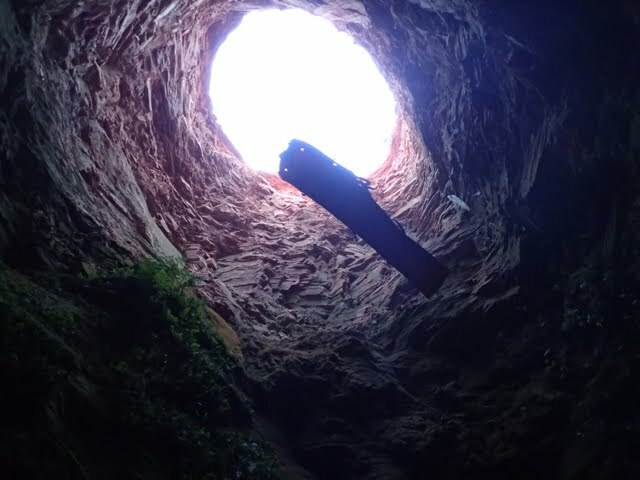 Steven disappeared from view as he neared Pedro at the bottom of the shaft. It became quiet, almost too quiet. I started undoing the rigging that was initially done. The dust road became alive as a cloud happily tracked John’s Landy on the horizon. I phoned Steven to inform him. John and Selena arrived and actions started falling into place. We de-rigged all ropes in order to get the winching system up. Steven’s car was moved and we scurried around getting the rigging done. Dust clouds speckled the horizon as more and more vehicles arrived. Adam, from MSAR, arrived after John and they had a quick discussion on the proposed manner to get Pedro safely out of Armageddon. It became dusk. Soon no dust clouds could be seen, but lights followed the snaky road in cosmic brilliance. The rest became lost in translation between what we did, said and thought. The bright orange SKED safely made it to the rim and between the original two anchor points manoeuvred closer to the edge. An extra belay line was attached by Adam and the SKED was pulled a safe distance from the hole. Paramedics zoomed in and Pedro was taken care of. The rope was let down in Armageddon twice more to get Steven and Herman to safety. We started de-rigging and packing gear away. I remember watching the bright red flashing lights of the ambulance as it found its way to the main road until it disappeared from sight. Ropes were bagged, other rescue gear was checked to a list and also packed away. It was time for all of us to meet at the main road for a debriefing of what had happened to Pedro and what followed. Just as quickly as this situation evolved, it ended just as abruptly. The freezing, gentle breeze was a stark reminder that we were still here, out in the middle of nowhere in winter time. A few groups gathered around as I drove passed them. My foot was throbbing, I misplaced most of my clothes searching for some gear in my car and two hours from home did not seem fair at that moment. A person can’t help to think that we were all part of something great tonight. Grateful that all turned out well, I turn up the volume. Armageddon still remains an infinitely amazing cave system. PS – For those who are interested in cave rescue send an email to sjtucker135@gmail.com to get invited on the next practise session.